Of course, not everyone will need all of the above (and probably couldn’t even fit it all in, especially if you have a small bedroom). So prioritise your essential bedroom furniture before you start trying to squeeze in a chaise longue or anything like that. When planning your bedroom furniture layout, you want to leave as much open floor space as possible at the door entrance. This needs to be your least “cluttered” area, as this is essentially how you are greeted when you first enter the room. You don’t want to be greeted by mess and clutter. Make sure that the door is able to open all the way without knocking into wardrobes or dressers. When deciding on what furniture to include and what to do without, remind yourself how you are most likely to use the bedroom. Having a writing desk in the corner may sound like a wonderful idea, but if it’s not going to be utilised it’s just going to take up valuable floor space. If you always get ready in the bathroom, do you really need that dressing table? Is it time to downsize your wardrobe? The bed is the most natural focal point of any bedroom. The traditional placement of a bed is positioned centrally against the opposite wall to the door. But this isn’t always possible. If this bed placement just doesn’t work for the shape and size of your bedroom, the second best choice is usually against the longest wall. But you should always use your better judgement. So long as you have enough space to get into bed. If you share the bed, then you will need space to climb into bed from either side. If you don’t, then there is no reason why you can’t have your bed pushed against a wall in the corner to save space. But what about irregular shaped bedrooms? Not everyone has a perfectly rectangular bedroom. But irregular shaped bedrooms present their own unique problems, and it can often feel a challenge to picture how the room should be laid out. Whether you have sharp angles, awkward alcoves or an L-shaped bedroom, there are tips and tricks to making the most of the unique shape of your bedroom. 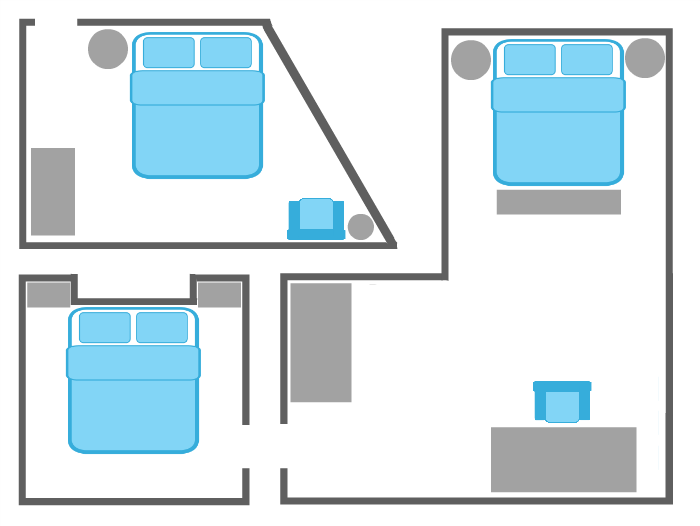 The above diagram is not intended to be a conclusive layout for irregular shaped bedrooms, but inspiration for how to use the space available to you. 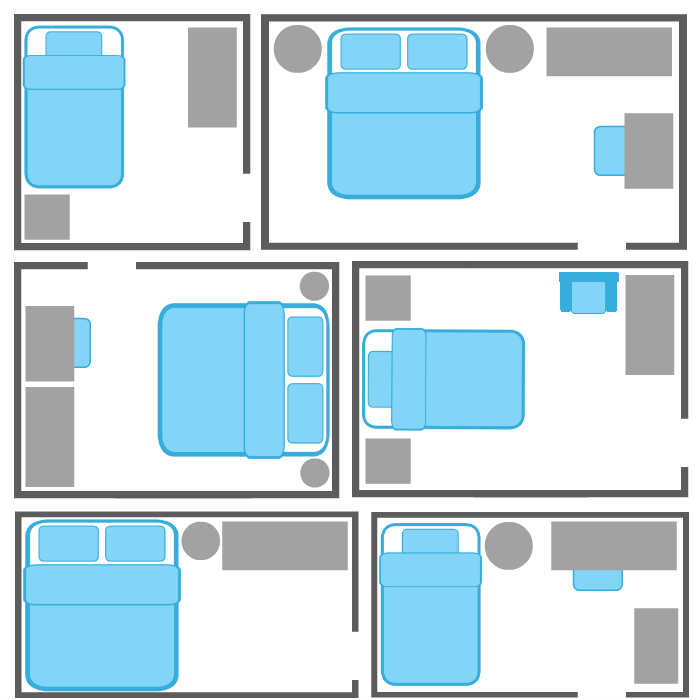 The furniture arrangements from the first diagram can be applied to odd shaped bedrooms, with the addition of a few tweaks to balance out the space. You can visually soften any sharp angled corners to appear less harsh with the help of something circular, spherical, or just something rounded. This could be in the form of a small, round lamp table in a reading nook, or a round-edged bedroom chair. If it’s a tight corner, try to de-clutter the corner so that it’s less heavy on the eyes, with the simple rounded focal point to soften. L-shaped bedrooms provide a great opportunity to section off areas of the room without separating the theme of the room completely. Use cohesive design throughout, but section off different areas of the bedroom for different purposes using a central space to unify the room. You can use area rugs to almost create “wall-free” rooms within the large room, and create different spaces such as a “getting ready” area, sleeping area and desk area. Use awkward alcoves for floor-to-ceiling storage. If you have a particularly small bedroom, make as much use of the walls as you can, perhaps in the way of floating shelves. You want to keep as much off the floor as possible, as the appearance of more floor space will visually enlarge the room. A bookcase or some shelves can fit nicely into an alcove to display your books or other knick knacks attractively whilst making the most of the space. Much like using contouring cosmetics to sculpt someone’s face in order to highlight their best facial features and distract from their less flattering, you want be thinking about your bedroom in the same way.